It was with some trepidation that we looked down from the high sides of “The Spirit of Tasmania” (ferry) at the wind and rain swept port at Devonport where we had docked. Evelyn and I (John) are from South Africa. I am 75 and still working and Evelyn is 57 and a remedial teacher. We had visited Australia on a number of occasions, done many of the things to do and been to many of the cities and sights. We were also experienced (tent) campers, but there were two firsts for us on this trip: We had never been to Tasmania and we had never been in nor driven a campervan. What was in store for us? How would I handle the driving? What would the campsites be like? We waited in the terminal for some time watching the rain and rang up Cruisin Tasmania as soon as they were open. They confirmed that the van would be delivered to the terminal. Sure enough it was a few minutes early and we were able to bring across our luggage and sit inside the vehicle out of the rain to deal with the paperwork and learn the ropes. The van was fitted out superbly. (We used the heater, but not the air conditioner!) Behind this was a table and benches that became a queen sized bed. Bedding, towels and teacloths were provided. The van carried its own water supply of 85 litres and its own waste water tank and lavatory capsule. It was made by Talvor of Australia on a VW Crafter base. The beauty was that it was of a common width so there was no extra width behind the driving cab. It was however about 7metres long. The caravan portion was accessible from the drivers cab and had a shower and toilet, clothes cupboard with all the electrical switches, TV Generally there was no signal except in Launceston. (We found out later that it was also a DVD player) Sink with mixer tap, 3 burner stove, electric fridge that worked off one of the two batteries, and ample storage space.It had a microwave and a heater/air conditioner for 220v use. Soon we said goodbye to the very helpful man who had brought the van from Hobart and eased out of the car park, quickly realising the length of the vehicle and the need to allow for this when turning. The van was surprisingly easy to drive and handled well. The feel and controls were like a well appointed car. Easily mastered, the 6 speed tiptronic gearbox offered a choice of fully automatic or sequential shift and was a joy. We were soon on the dual carriageway to Launceston. We learned the first benefit of campervanning as we were able to stop in a village and enjoy a cup of coffee made in the van and drunk there in comfort out of the rain. We ”camped” at Treasure Island Campsite in Launceston, Tasmania’s second city after stocking up at Coles. The site was somewhat muddy as it was still raining, and a floor mat would have come in most useful, but we bought “The Australian Weekend” edition that had enough pages to suffice.At last the rain stopped and we were able to enjoy a circular walk up a tributary to the Tamar River which had Victorian connections. We discovered that it was easy to pack up and go and return in a campervan. This we had thought would be an issue, but we had an allocated site and packing up was a quick process. We enjoyed our first dinner on Tasmanian soil. Coming from Africa to an Aus summer, we were caught out by the cold after the rain and next day had to buy tracksuit pants at K-Mart to sleep in as shorty pyjamas were certainly not warm enough! 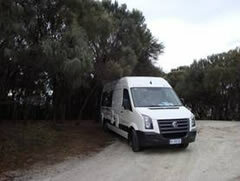 It was the first time we had used an Australian campsite and we found all the commercial sites we used of a high standard and clean and our fears of loud music late into the night were unfounded. 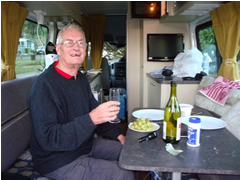 We had used the toilet and washbasin in the van and thus used the dumpsite on the campsite. We found the emptying of the waste water a slow process and minimised the use of the onboard sink in future. The next day, we visited the centre of Launceston and found it to be a delightful city. We then drove the windy hilly road through a lot of forests to St Helens on the East Coast. The rain had gone and we found the countryside somewhat similar to New Zealand and very pleasant. I had no problems with the driving. At one spot I felt very tired and felt I needed to stop. I parked in a parking place and learned another advantage of a campervan. I merely stretched out and went to sleep on one of the long benches in the van. We decided to try a free campsite at Sloop Bay at the Bay of Fires and found a spot to ourselves that had no facilities at all. The van came into its own as we were self contained and very snug. We loved the rocks and beaches at the Bay of Fires and explored the area the next morning, going further north to the car park at the Gardens. We drove back to St Helens and spent the night at the BIG 4 site there. We liked the atmosphere of St Helens and had very acceptable fish and chips cooked on a boat in the harbour. We explored the town and discovered the memorial gardens dedicated to fishermen. We were surprised at how many had lost their lives in pursuing their livelihoods. 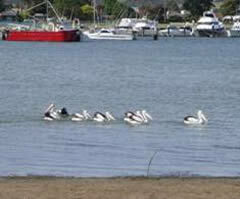 We were pleased to see pelicans, which we had not seen since we were in Swakopmund, Namibia some years ago. They were in St Helens in abundance. The following morning, we drove down the coast through Scamanda. The sea was so blue. We diverted to the Douglas Apsley National Park. We had time for a short walk to a river in the park. When we were on the ferry, we had bought a holiday vehicle National Parks pass and the cost was worthwhile as we were able to visit several of the 19 National Parks in Tasmania. 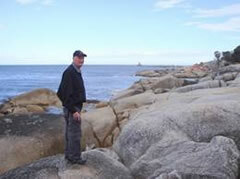 We stopped at Bicheno to get supplies and to look at the beach. We camped that night at the Big 4 site at Coles Bay. This at AUD 40 was our most expensive night. We were able to walk around the place and saw a party going out in kayaks. The next day, Thursday was a high spot. We entered the Freycinet National Park and walked the circular Wineglass beach trail which took us 5 hours for the close to 11kms. Wineglass Bay was a perfect shape and the sea was extra blue. New spectacular views opened up almost at every turn. We were also able to drive to Tourville lighthouse where there are also dramatic views. That night we had our best “camping” night. We drove to the nearby Friendly Beaches, recommended by a park ranger and also in the National Park. Here we had a site to ourselves and a pit toilet that came complete with a fully charged toilet roll dispenser. The cost was zero. We really used the facilities of the van and were able to each have a hot shower. We could easily have survived there for two nights using the facilities of the van. The beaches were long, the sea was blue and there were very few other visitors. We enjoyed the absolute peace, stillness (apart from the waves) and the stars. 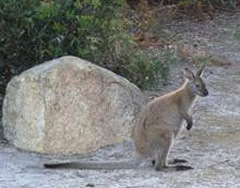 We saw a few wallabies whilst we were there and it was obvious that campers had been feeding them. We work on the basis that wild animals know how to fend for themselves. We said a reluctant goodbye to this site which was a highlight of our trip and drove back and down to Swansea then to Triabunna which is where the ferry goes from the Maria Island. It is a crayfish area and we saw lots of boats and were impressed with the splendid visitor centre. We drove across country to Sorell and stocked up for Christmas at the new Coles there. We also went to the Sorell Fruit Farm and I picked a 1.2kg punnet of mixed soft fruits and cherries. 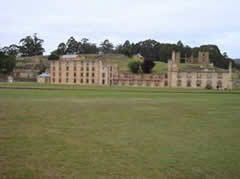 On then to Port Arthur where we had a quick visit to the Historic Sites before going on to the Remarkable Cave. This really is remarkable - caused where two types of rock meet. 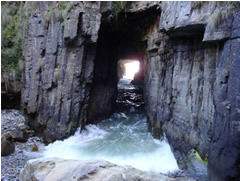 It was stated that some intrepid surfers launched themselves off through the cave. 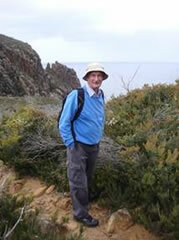 We found the sea coast views in this area outstanding with rough seas and spectacular cliffs. This included a distant view of Tasman Island. Our site for the next two nights was White Beach about 10kms away. Christmas Day saw us at St Albans Church Koonya. 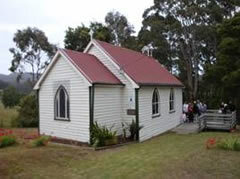 Our home church is also St Albans- but a very different one-a large urban brick church compared with this small wooden one. We could hear the cattle lowing during the service and this had significance to us on Christmas day. We were made very welcome and this was our experience of all the Tasmanians that we met- it was a bit of a culture shock when we got back to mainland Australia and were officiously told off for standing on the wrong side of a counter! We drove round to Port Arthur again and took advantage of a special Christmas day pass into the Historical Sites. What a place! A penal colony from the 19th century. It operated for about 40 years and thousands passed through its portals. Our guide (Lauren) was excellent and was able to bring back some of the past and had a store of tales about several of the convicts. It was relatively easy to be deported from the UK and the life in Port Arthur was anything but easy. 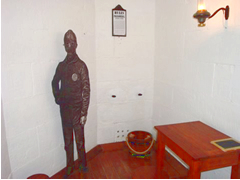 Chilling were the 18kg leg irons and the “Separate Prison’ where prisoners on punishment were kept in solitary confinement and silence for months, being allowed an hour a day solitary exercise. They were made to go to church and were kept in coffin shaped pews so that the only human face that they saw was the preacher and the occasional warder. It is little wonder that some went mad. A touching corner was the Garden of Remembrance close to the old café where a gunman ran amok in April 1996 and killed 35 people there and in the vicinity. Curiously, we remembered nothing whatsoever about this event that must have been world news as Australia’s worst killing. We were in Zimbabwe at the time and could only think that we were away in the bush. There is a lot to see at the historic site and we could have spent more time there, but being Christmas day, it closed early. Boxing day saw us walking at Fortesque Bay National Park and we walked to Cape Hauy. This was a tough grade 3 walk with some long steep and rough inclines and we did not quite make it to the end due to time and bad weather. The views were again stunning when the rain cleared. We reluctantly set our sights on Hobart for the last two nights of our stay in Tasmania. The bustling Treasure Island campsite was a bit of a culture shock after Friendly Beaches. It was good however to see the odd rabbit hopping around and the ducks with their broods of chicks. Our last full day was spent in Hobart and I made the only mistake of the trip when I parked the van in a nearly empty public car park. When we returned two hours later after seeing the sights, the car park had filled up and at 7metres of campervan was nicely boxed in. With the help of my wife at the back and a helpful motorist at the front and many back and forths we managed to extricate it. I made a note for the future not to get into such a situation and if possible to be linier parked in a street or where I was sure I could get out. We found new parking and went to the Soldier’s Walk where the almost 500 soldiers from Hobart who died in the First World War are commemorated by a tree and a plaque. 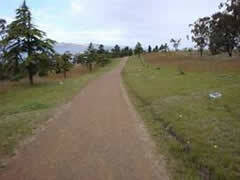 The park has been renovated recently and new cedar trees planted. It seems to go on for ever and some of the descriptions on the plaques are quite moving. The average age of those killed is about 26, most of them single, but some with a wife and quite large families.The youngest was 17 and oldest 47. 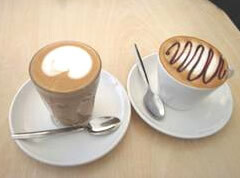 From there we walked to the Botanical Gardens that are very well maintained and with great variety and we enjoyed exciting cups of coffee. This was our last night in Tasmania and the next morning we handed the vehicle in at the airport before we flew to Melbourne. It was a sad moment to part company with what had become a reliable friend that had allowed us to enjoy something very different and taken us to amazing places in such comfort.